In 1944…heavy snowfall totaled 7.5 inches in downtown Denver. Northwest winds were sustained to 18 mph on the 16th. In 2009…a potent spring storm brought heavy snow to locations in and near the Front Range foothills. A deep easterly upslope produced nearly 5 feet of snow in parts of the foothills. The heavy snow resulted in the closure of interstate 70…from Golden west to Vail…for approximately 16 hours. The heavy snow snapped power lines in Evergreen and Nederland. The ensuing outages affected 14200 residents. In the Front Range foothills…storm totals included: 56 inches…3 miles south of Rollinsville; 54 inches…3 miles southeast of Pinecliffe…43 inches at Aspen Springs…42 inches at Evergreen…38 inches near Conifer; 37 inches at St. Mary’s Glacier…and 34 inches near Nederland. Along the urban corridor and Palmer Divide…the heaviest snow occurred above 5500 feet on the 17th. Storm totals included: 22 inches…8.5 miles southwest of Franktown; 18 inches…10 miles south-southeast of Buckley Air Force Base; 17 inches near Cherry Creek and 7 miles south of Sedalia… 16 inches…6.5 miles southwest of Castle Rock; 15 inches near Beverly Hills; 12 inches near Highlands Ranch and Lafayette…with 11 inches in Broomfield. Elsewhere storm totals ranged from 4 to 10 inches. Officially…only 2.6 inches of snow was observed at Denver International Airport. The 24-hr precipitation for the day however was 1.16 inches… Which established a new record for April 17th. In 1889…northwest winds were sustained to 48 mph. In 1899…apparent post-frontal north winds were sustained to 42 mph with gusts as high as 48 mph. In 1935…light dust moved over the city behind an apparent dry cold front…which produced northeast winds to 19 mph with gusts to 20 mph. In 1978…winds estimated to 70 mph occurred in Morrison. Northwest winds gusted to 49 mph at Stapleton International Airport. In 2000…strong pre-frontal winds and widely scattered thunderstorms caused high winds to develop across northern metro Denver and portions of the northeast plains. Peak wind gusts included 75 mph at Louisville. South winds gusted to only 28 mph at Denver International Airport. In 2002…strong southwest winds in advance of a cold front gusted to 52 mph at Denver International Airport. In 2003…severe thunderstorms produced 1 inch diameter hail 7 miles east of Brighton. Strong thunderstorm winds blew out an auto windshield near Denver International Airport where south winds gusted to 48 mph. In 1878…the wind blew violently all day on the 17th with a maximum sustained velocity of 40 mph. Dust hung over the city like a cloud. The relative humidity was zero nearly all day. A terrific gale blew overnight. There was much damage to buildings…signs…fences…etc. Some wind gusts were so strong as to jar buildings to their foundations. The station anemometer recorded sustained winds to 50 mph with higher gusts before it was damaged by the winds. The winds moderated during the day on the 18th and ended at sunset. In 1894…post-frontal rain changed to snow on the 17th around sunrise and continued through 9:00 am on the 18th. Snowfall totaled 10.5 inches…but most of the snow melted as it fell. The high temperature warmed to only 35 degrees on the 17th after a high of 76 on the 16th. Northeast winds were sustained to 30 mph with gusts to 32 mph on the 17th. In 1998…more spring snow fell across metro Denver and in the foothills. Snowfall totals included: 11 inches at Golden Gate Canyon; 10 inches at Highlands Ranch; 9 inches at Elizabeth; 8 inches at Broomfield and Morrison; and 7 inches at Chief Hosa…Evergreen…Littleton…and Sedalia. Snowfall totaled only 3.2 inches at the site of the former Stapleton International Airport. North winds gusted to 22 mph at Denver International Airport. In 1920…snow fell across the city continuously for 57 hours… From the early morning of the 17th until 11:40 am on the 19th. The heavy wet snowfall totaled 18.2 inches with the greatest accumulation on the ground of 12 inches. Winds during the storm were strong with sustained speeds in excess of 27 mph for over 40 consecutive hours…which created near-blizzard conditions. The highest recorded wind speeds were 44 mph with gusts to 50 mph from the north on the 17th and 39 mph with gusts to 48 mph from the northwest on the 18th. The strong winds piled the snow into high drifts which stopped all Denver traffic. Railroads were blocked with only one train entering the city on the 19th. All interurban trains were blocked…as were the 13 trolley lines. Thus…many workers were unable to get home at night and filled all of the downtown hotels to capacity. No grocery or fuel deliveries were possible… Except milk and coal to hospitals and to families with babies. No lives were lost in the city…but several people perished in surrounding districts. Stock losses were heavy on the plains. Temperatures during the storm were in the 20’s. In 1877…strong winds blew all day with an average sustained velocity of 36 mph. The maximum sustained velocity was 60 mph. No significant damage was reported. In 1903…northwest winds were sustained to 48 mph with gusts to 53 mph. In 1936…light dust spread over the city from the east on southeast winds gusting to 25 mph. The surface visibility was reduced to about 2 miles at times. In 1940…this date marked the start of the longest period without snow…200 days…through November 3…1940. A trace of snow fell on both April 17…1940…and November 4…1940. In 1963…strong winds were prevalent all day across metro Denver. West-northwest winds gusting to 60 mph produced some blowing dust at Stapleton Airport. In 1971…a microburst wind gust to 59 mph produced some blowing dust at Stapleton International Airport. In 1978…high winds caused much blowing dust over the plains. Wind gusts from 80 to 96 mph were reported in Boulder with 80 mph measured on Lookout Mountain. Northwest winds gusted to 43 mph at Stapleton International Airport. In 2000…high winds developed in the foothills of Boulder County. Peak wind gusts included 71 mph at the National Center for Atmospheric Research mesa lab near Boulder. In Aurora…three workers were injured when strong winds caused a home under construction to partially collapse. Two received minor injuries…while the third worker had to be hospitalized with severe back injuries. South winds gusted to 47 mph at Denver International Airport. In 2002…strong northeast winds behind a cold front gusted to 53 mph at Denver International Airport where some blowing dust briefly reduced the visibility to 3 miles. In 1884…a major storm dumped 13.8 inches of snowfall on downtown Denver. Most of the snow…10.0 inches…fell on the 18th. Light rain on the early morning of the 18th changed to heavy snow at 8:00 am and became light after 2:00 pm but continued until 4:00 am on the 19th. The snow melted nearly as fast as it fell. There were only 3 inches on the ground early on the morning of the 19th. In 1941…heavy snowfall totaled 8.4 inches over downtown Denver. Northeast winds were sustained to 17 mph. In 1993…sporadic high winds occurred across metro Denver. Significant wind gusts included 97 mph at Rollinsville… 80 mph in southwest Boulder…and 55 mph at Stapleton International Airport. The strong winds snapped a pine tree top…about 15 feet long and 8 inches in diameter…which crashed through the roof of a church in Evergreen…causing one thousand dollars in damage. Wind gusts of 50 to 60 mph caused structural damage to 3 homes under construction in Broomfield. Northwest winds gusted to 55 mph at Stapleton International Airport. In 1995…the second spring storm of the month dumped heavy snow in the foothills. The upslope flow along with areas of thunder snow dropped 6 to 12 inches of snow in the foothills west of Denver and Boulder. Snowfall totaled 4.6 inches at the site of the former Stapleton International Airport…but most of the snow melted as it fell. East winds gusted to 29 mph at Denver International Airport on the 18th. In 1966…sub-freezing temperatures caused thousands of dollars in damage to fruit trees across metro Denver. Minimum temperatures were in the teens each morning and failed to reach above freezing on the 19th. The low temperature of 13 on the 20th set a new record minimum for the date. Snowfall totaled 5.7 inches at Stapleton International Airport during the period. In 1899…northwest winds were sustained to 48 mph with gusts as high as 60 mph in the city. In 1941…the last snow of the season…0.4 inch…occurred… Marking the end of the shortest snow season…167 days. The first snow of the season…a trace…occurred on November 4…1940. In 1954…strong gusty winds raked metro Denver for most of the day producing some blowing dust. At midday…a severe dust devil was sighted in the Westwood area of southwest Denver. In 1955…cold west winds at 52 mph with gusts as high as 69 mph were recorded at Stapleton Airport where blowing dust reduced the visibility to 1/2 mile. In 1960…the second wind storm in 3 days produced sustained west winds up to 44 mph with gusts as high as 58 mph at Stapleton Airport. Winds were strong and gusty most of the day…but no damage was reported. In 1963…the second windy day in a row produced west- northwest wind gusts to 52 mph at Stapleton Airport. In 1971…a tornado occurred in the southwest corner of weld County about 10 miles west-northwest of Brighton. The storm moved through a farm yard damaging equipment and structures. The strong tornadic winds lifted a stock tank over 2 fences into a corral 150 feet away. Later…a tornado touched down briefly west-southwest of Buckley Field…8 miles southeast of Stapleton International Airport. No damage was reported. In 1985…high winds occurred in the foothills. Winds gusted to 97 mph atop Squaw Mountain in the foothills west of Denver. West winds gusted to 37 mph at Stapleton International Airport. In 1987…a powerful cold front produced high winds and engulfed metro Denver in huge clouds of blowing dust that lowered the visibility to as little as 100 yards. The cold front generated winds as high as 72 mph at Brighton…67 mph in Thornton…and 54 mph at Stapleton International Airport. Winds of 50 to 70 mph were common along the Front Range from Denver north. The high wind gusts flipped a light plane taxiing at Stapleton International Airport…slightly injuring two people on board. The cold front dropped the temperature from a high of 80 degrees at 3:00 pm to a low of 33 degrees at midnight. Nearly an inch of snow…0.8 inch… Fell at Stapleton International Airport before midnight. In 1988…a tornado touched down in Fort Lupton…following a path 50 to 75 yards wide for 2 1/2 blocks. The twister damaged roofs on 2 schools and broke numerous windows; about 10 houses were damaged and several cars had windows blown out. Several trees were downed. In 1989…winds were clocked to 68 mph in Wheat Ridge. Microburst winds gusted to 35 mph at Stapleton International Airport. In 1996…high winds gusting from 70 to near 100 mph developed in the Front Range foothills and adjacent plains. Numerous power outages were reported as power lines and poles were downed. The high winds blew the chimney off the roof of a house in Westminster. Numerous homes received minor shingle damage. Some of the stronger wind gusts included: 98 mph at Jefferson County Airport in Broomfield…91 mph atop Squaw Mountain west of Denver…and 75 mph atop Table Mesa near Boulder. West northwest winds gusted to 45 mph at Denver International Airport. In 2001…westerly Chinook winds…gusting as high as 40 mph at Denver International Airport…prevented the low temperature from dropping below 51 degrees…setting a new record high minimum for the date. The high temperature of 77 degrees was not a record. In 2005…severe thunderstorms produced large hail across metro Denver. Hail as large as 1 1/4 inches in diameter was measured in Arvada. Hail to 1 inch in diameter fell in Westminster…Northglenn…and Thornton. Hail to 7/8 inch was reported near Brighton…Barr Lake…and Castle Rock. Hail to 3/4 inch fell in Elizabeth and Broomfield and near Golden…Brighton…and Fort Lupton. 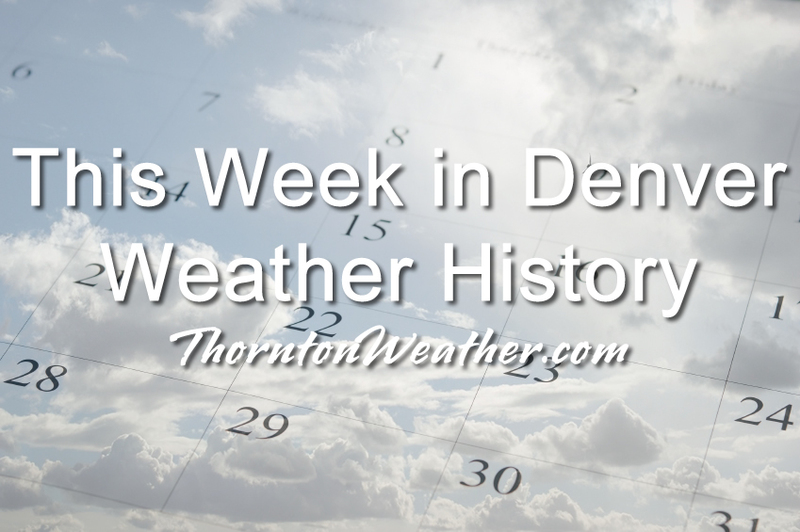 In 1892…rain on the 18th changed to snow on the 19th and totaled 6.0 inches over downtown Denver into the 20th. Total precipitation was 1.56 inches. North winds were sustained to 26 mph on the 19th. In 1907…a major storm dumped 18.0 inches of snowfall in downtown Denver. Much of the heavy wet snow melted as it fell. The most snow on the ground was 7.0 inches at 6:00 pm on the 19th. North to northeast winds were sustained to 42 mph on the 19th and to 21 mph on the 20th. High temperatures were in the low to mid 30’s with low readings around 20. In 1984…a large snowstorm buried most of Colorado under a thick mantle of wet snow. Total snow amounts ranged from 10 to 20 inches across metro Denver and a whopping 20 to 40 inches in the adjacent foothills. The snow closed roads and damaged electrical transformers…causing numerous power outages. Nearly 14 inches (13.6) of snow fell at Stapleton International Airport where the combination of snow and wind closed all but one runway…resulting in the cancellation of many flights. Both I-70 and I-76 were closed to the east of Denver. In 1933…a major storm dumped 16.8 inches of snowfall over downtown Denver when rain changed to snow during the early morning of the 20th and continued through midday of the 22nd. Most of the snow fell on the 21st. Due to melting… The most snow on the ground was 10.5 inches at 6:00 pm on the 21st. Before the snow started…a strong cold front on the evening of the 19th produced north winds sustained to 35 mph with gusts to 37 mph. The strong winds deposited a thin layer of dust on the city. North to northwest winds were sustained to 31 mph with gusts to 35 mph on the 20th and to 29 mph with gusts to 32 mph on the 21st. In 1874…light snow fell for most of the day…but melted almost as fast as it fell. The flakes…as large as 1 1/2 inches in diameter during the afternoon…resembled white feathers. Precipitation from melted snow was only 0.21 inch in the city. Snowfall was much heavier in the mountain parks where snow depths were reported between 3 and 5 feet from the storms of the 15th and 20th. The heavy snow resulted in the deaths of hundreds of cattle and sheep. In 1875…the city was enveloped in a severe wind and sand storm. For nearly 30 minutes before the storm…it could be seen moving toward the city from the northwest as a black wall of clouds extending only 10 degrees above the horizon. At 5:30 pm…the sand was sweeping past in such clouds that objects at a distance of only 10 yards were not visible. The streets were entirely deserted. The greatest velocity of wind during the storm was 36 mph from the north-northwest. The storm diminished by 7:00 pm. Swarms of grasshoppers were seen today and were reported in all parts of the territory. In 1897…southwest winds were sustained to 46 mph with gusts to 50 mph. The apparent Chinook winds warmed the temperature to a high of 76 degrees. In 1905…apparent post-frontal north winds were sustained to 43 mph. In 1912…west winds were sustained to 42 mph with an extreme velocity of 48 mph. In 1958…strong Chinook winds gusted to 52 mph at Stapleton Airport. In 1981…3/4 inch hail fell in Lakewood with up to one half inch of rain in a few minutes across northern sections of the city of Denver. Thunderstorm rainfall totaled 0.39 inches at Stapleton International Airport…where 1/4 inch hail was also measured. In 1987…6 to 12 inches of heavy snow fell in the foothills. Only 2.5 inches of snow fell at Stapleton International Airport where the usual flight delays occurred. In 2005…severe thunderstorms produced large hail across metro Denver. Hail as large as 1 3/4 inches in diameter fell at Denver International Airport. Hail to 3/4 inch in diameter fell in and near Golden and near Hudson… Keenesburg…Barr Lake…and Bennett. In 2013…an avalanche pushed a group of six snow boarders into the Sheep Creek gully of Loveland Pass. This is near but outside the Loveland Ski Area boundary. Five of the six members of the group died as they were completely buried. The avalanche is the deadliest in Colorado since 1962 when seven people were killed when a slide buried residents at Twin Lakes near Independence Pass. In 1957…strong and gusty south to southeast winds raked metro Denver each day. The strongest wind gust of 55 mph occurred on the 21st when blowing dust briefly reduced the visibility to 3/4 mile at Stapleton Airport. In 1989…unusually warm weather resulted in several daily temperature records being broken in Denver. The high temperature of 89 degrees on the 21st exceeded the record maximum for the month at that time. Daily record high temperatures were either exceeded or equaled with 83 degrees on the 20th…88 degrees on the 22nd…and 85 degrees on the 23rd. The low temperature of 55 degrees on the 22nd equaled the record high minimum for the date. This entry was posted on Sunday, April 14th, 2019 at 5:59am MDT and is filed under Weather History. You can follow any responses to this entry through the RSS 2.0 feed. You can skip to the end and leave a response. Pinging is currently not allowed.